4-room apartment 108 m2 on 1st floor. Cosy and wooden furniture furnishings: entrance hall. 1 room with 2 beds (length 190 cm), hand-basin. 2 double bedrooms, each room with shower/WC. Exit to the balcony. Kitchen-/living room (oven, dishwasher, 4 ceramic glass hob hotplates, microwave, freezer, electric coffee machine) with dining nook and satellite TV. Exit to the balcony. Shower/WC, sep. WC. Large balcony. Balcony furniture, deck chairs. View of the mountains and the countryside. Facilities: Internet (WiFi, free). Modern small apartment house Rosi. 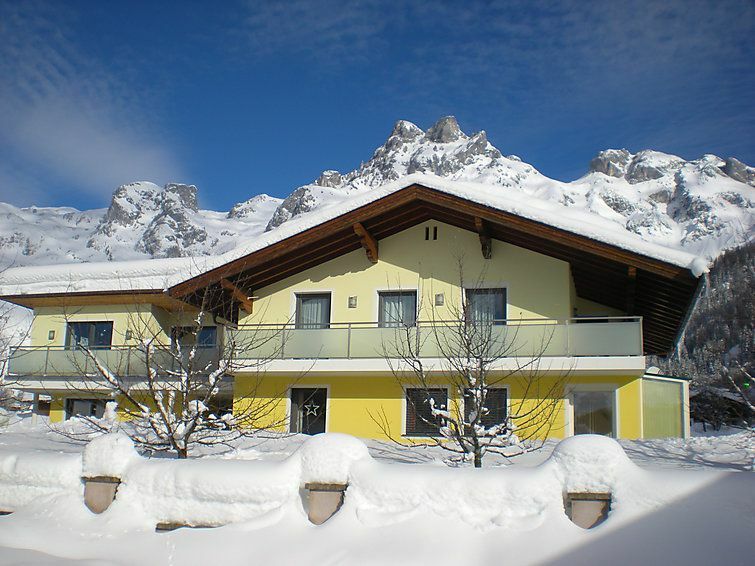 On the outskirts, in a quiet, sunny position, 2.7 km from the skiing area, in the countryside. For shared use: garden, lawn for sunbathing. Barbecue, barbecue house, children's playground (slide, swing, sandbox). In the house: sauna (extra). Infrared sauna, relaxation room, storage room for skis, ski boot dryer. Parking at the house. Grocery 1 km, restaurant 1.3 km, bathing lake Wengsee 1.7 km. Tennis 1.7 km, gondola lift 2 km, ski school 2 km, cross country ski track 20 m, ice field 1.7 km. Please note: ski bus (free of charge). Property ref. 5453.110.2 is situated on the same property. Enjoy this house of special offers ecomobility-SAMO (optional). Spend your vacation without a car without losing your mobility. Free transfer to and from the station, free bicycles, electric vehicles in Werfenweng, free night transfer and excursions in the area, as well as free entry to Wengsee Leisure Park. Infrared cabin (extra! ).